Products and services for graphical LCD- and touch displays and for the development of embedded systems. For providing the user with a friendly user interface, graphical user interfaces (GUI) offer the most flexible options. To make these user interfaces easy to realize for our customers is our goal: - "simplify technologies" ! Our range of products and services cover intelligent LCD modules, ready to be used in an application, a software library (GUI library) for graphical user interfaces and development services according to customer's specifications. Starterkits help to start application development quickly. Having long-term experience in the field of embedded systems we will also be glad to develop the hardware and software needed for your special system. With our intelligent LCD modules your systems can be easily equipped with an attractive graphical user interface. The modules are available with a variety of color TFT displays with or without touch. Customer specified modifications can also be realized. Using the GUI library allows to program your own graphical user interface comfortably in ANSI-C. 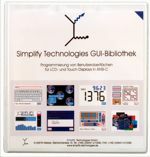 The GUI library comes in source code and includes drivers for various LCD controllers. For your choice of display, wether monochrome, colour or touch display. If you look for additional development capacity or want to make use of our specific know how, we will be glad to provide development services for software and hardware. These services range from the development of a prototype up to the product ready for series production.